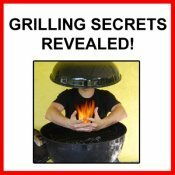 Every wondered how to grill fish? Grilling fish may seem difficult at first due to the delicacy of its texture. You may have even destroyed some fish filets on the grill as they tend to fall apart as you try to lift them from the grill after cooking. However, you can definitely do it well if you just keep a few tips in mind. Grilled fish can be delicious so if you want to learn a few new tricks just read on! Cook Right on the Grill with Firmer Fleshed Fish - If you stick to firm fleshed fish varieties, particularly if cut into steaks rather than filets, you will have an easier job. In fact, some firmer fish, such as shark, swordfish and even big, thick steaks of salmon, can be grilled directly on the grill like any other food. You still need to be careful when flipping and removing from the grill, but these are much less likely to fall apart. For more delicate fish, halibut, sole, etc, don't throw a filet right on the grill or you will loose it! Use a Spatula - I rarely use a spatula in grill cooking. For most cuts of meat like steaks, chicken breasts and thighs, and lamb a nice tongs are the easiest to manipulate and move things around on the grill. However, a spatula can come in handy in a couple situations. Delicate cuts that lay flat against the grill can tend to tear or fall apart when lifted from the grill. 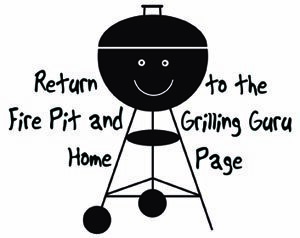 In these cases a big spatula can be used to gently slide underneath the food, separating it gently from the grill, and then lift it to flip or take off. This is particularly helpful for fish filets or steaks. If you try to grab a fish filet off the grill with a tongs, it will rip and fall apart. Use a Grill Skillet - If you prefer to grill fish without all the worry, one easy option is to throw a skillet (I like to use a cast iron pan) on the grill and after adding a bit of butter or olive oil frying the fish in the pan rather than directly on the grill. This avoids the problems with sticking and tearing on the grill. You can use a spatula to flip the fish in the pan. While you don't get as much grilled fish smokey aroma and flavor this way, if you close the grill lid while you are cooking for a couple minutes you will get some of that nice smoke to permeate your fish. Cook Whole Fish, Not Filets - One excellent way to cook fish on a grill is to leave it whole rather than cooking delicate filets or steaks. Leave the skin on to act as a protective layer so that the flesh is not burnt or torn. 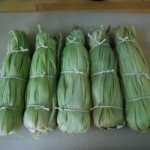 Some people like to first stuff the body cavity (with herbs, seasonings and slices of lemon, for example) and/or wrap the fish, for example with grape or banana leaves. 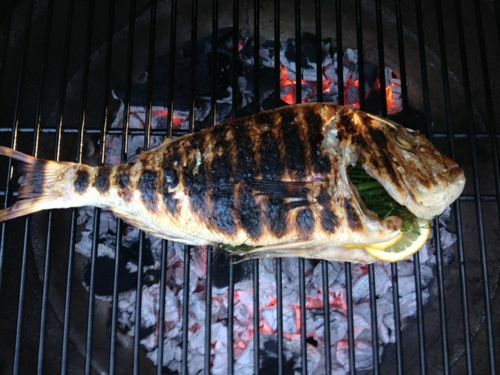 The fish can be cooked this way directly on the grill, in a skillet or in a fish grilling basket (see below). 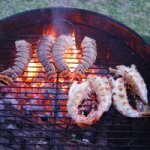 Use a Fish Grilling Basket - Last but not least, if you think you would like to grill fish relatively frequently, investing in a fish grilling basket might be a wise investment. If you have not seen them, these are large metal cages roughly in the shape of a fish with a long handle. You lay your whole seasoned fish in the basket, close it, and lay it over the grill to cook. When you need to flip it, you don't have to even touch the fish! Simply flip the whole cage! No risk of sticking or tearing. When it is done, remove to a table, gently open and flip your fish out onto a serving platter. These grilling baskets, along with ones made for sausages, hot dogs, corn and other foods, can be found at most places where grilling supplies are sold. Done with the How to Grill Fish recipe?